Click to enlarge Play Synopsis:Adesewa. is an exciting performance laced with drama, music and dance. Life has its ups and downs and when the unexpected happens, it can throw you completely off your feet! 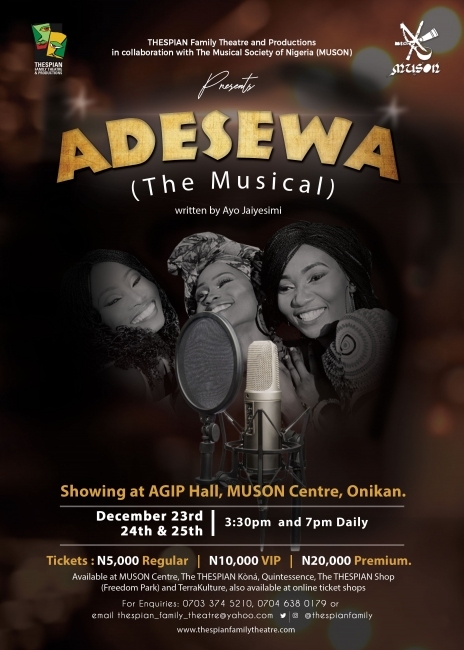 Will Adesewa, the girl with the golden voice, manage to keep her passion and hope alive in the face treachery and deceit. Will love find her or will she find love in the midst of the complexities. NOTE: Adesewa (The Musical) show for December 24th, 7pm is sold out! Bullet Description: Will love find her or will she find love in the midst of the complexities.